UDM Downloads > Client/Server Comm Lib for Visual Basic! MarshallSoft Visual Basic and .NET TCP/IP and UDP/IP sockets client/server component for communication across a network such as the internet or intranet (LAN). CSC4VB uses the Windows API to communicate with other programs across any TCP winsock network. Features include: Can be used to create both clients and servers. Supports "one time" passwords and sessions keys for improved security. Data and files can be encrypted and decrypted. Supports secure and private messaging. Use with the MarshallSoft AES Encryption Library for strong encryption/decryption. Create chat server and clients. 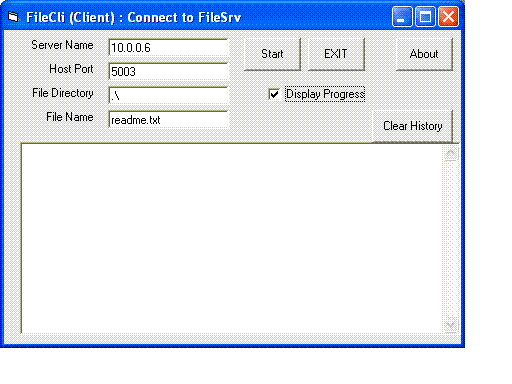 Create client / server file transfer. Create client programs to talk to TCP servers (POP3, IMAP, HTTP, FTP, SMTP, DNS, etc,). Connect to a device by sending commands to its IP address. Create SMTP proxy programs extracting a copy of all recipient addresses. Create POP3 proxy programs that filter incoming email for Spam. Create HTTP proxy used to filter content. Send and receive data buffers or entire files. Servers can handle multiple connections concurrently. Allows multiple servers and clients to run simultaneously. Specify the maximum number of connections that the server will accept when listening on any one port. Supports both 32-bit and 64-bit Windows. Supports both UDP and TCP protocols. Includes 45 functions and multiple examples to create client server applications. Free technical support and updates for one year. Royalty free distribution with your compiled application. Makes calls to Windows API functions only. Can also be used with Delphi, C/C++, PowerBASIC, Visual FoxPro, Visual dBase, Xbase++, and COBOL. License covers all programming languages. Purchase with or without C source code for the DLLs. Supports all versions of 32-bit and 64-bit Microsoft Visual Basic including .NET and Visual Studio. Supports Visual Basic for Applications (VBA) such as Microsoft Office, Excel and Access. Fully functional evaluation version.